After the long series of posts where I outlined the prevalance of umami ingredients in use in Asia, this singular post on umami ingredients from Europe and the Americas will seem rather paltry by comparison. You may be surprised to see ketchup in the illustration above; you shouldn’t be. Tomatoes have a large amount of naturally occurring glutamate–one of the largest amounts of any fruit, and so they pack an umami punch that nearly cannot be beaten. Why do you think the Italians, Spaniards, Portuguese, and French, once they ceased fearing that they were poisonous adopted them so readily into their cuisines? They are delightfully flavorful and enhance a remarkable number of food items. The addition of salt synergizes with glutamate and makes the umami taste stronger; this explains why when you salt a sunwarmed tomato, the fruit suddenly tastes more tomatoey.Ketchup has a good amount of salt, sugar and acidic components, making it a concoction that takes advantage of four of the five evolutionarily advantages basic tastes programmed into our palates. Ketchup is not the only form in which to utlize tomato-based umami; anything where the tomatoes have been cooked or treated in order to remove some of the water and concentrate the flavors will be brimming with huge amounts of umami. Like ketchup, tomato paste is made from whole tomatoes that have been simmered to remove most of the water; I prefer to keep on hand the even more concentrated form of it available in tubes. A tablespoon or two of that is enough to perk up anything that could benefit from a quick shot of tomato. Tomato paste can also be made of sun-dried tomatoes. Here, a second form of water-removal and flavor concentration is used in the processing of the tomato. I tend to prefer to use either plain sun-dried tomatoes or olive oil packed sun-dried tomatoe, instead of tomato paste–they are more versatile and texturally interesting by far. The completely dry ones can be run through the Sumeet to process them into a dark red, aromatic powder that can be used to garnish finished dishes, or they can be rehydrated and diced, or if one would like, pureed into a paste. Of course, one could also count any form of canned or fresh tomatoes or tomato juice as an umami ingredient. A secret ingredient to vegetable soup and spaghetti sauce my grandmother used to use was a shot or two of V-8 or Clamato juice. Clamato, in particular, is filled with glutamate, being made of both tomatoes and clams. When she sneaked it into her dishes, there was never a discernable seafoody flavor; the soup just tasted gratifyingly savory and good. 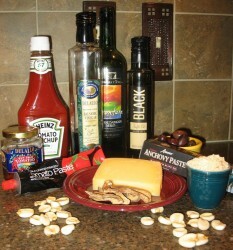 Worchestershire sauce is yet another Western umami ingredient. A potent brew of anchovies, tamarind, soybeans, vinegar, garlic, shallots, onions, salt, molasses and sugar, worchestershire sauce is a heady entry into the umami-lover’s arsenal. I, personally would consider it even more versatile and useful than ketchup, but that is simply a personal taste. A distant relative of fish sauce, worchestershire sauce has an interesting history that goes back to India under the British Empire, and has been commercially made since the 1830’s. But it is no wonder that the sauce is popular all over the world, being a popular table condiment in Europe, the United States, China and Japan, as it is a complex mixture of many natural sources of glutamate, and has hints of each of the five basic tastes that the human tongue is designed to discern. Speaking of anchovies, they figure prominently in the cookery of many European countries, such as Italy, France and Great Britan. These strongly scented little fish, as we already know from our discussions of fish sauce and worchestershire sauce, are absolutely packed with amino acids, and when fermented, packed in brine, salted and dried or mashed into a stiff puree, they bring a huge amount of umami to any dish in which they are included. I, personally, came late to my love of anchovies, and still am only fond of using them in cookery: I learned what they did for foods when I was in culinary school and learned to make real caesar salads. However, once I knew what they could do, I stopped being fearful of them, and have been known to slip some mashed anchovies or anchovy paste into a pasta sauce that has somehow gone awry. I learned that puttanesca is simply not right without a liberal dose of anchovy and that a bit of it in any tomato-based sauce will make it simple sparkle and shine in a way that is difficult to predict if one is not aware of the existance of umami. Ripe olives contain a significant amount of umami taste, and when used with tomatoes and anchovies, as in the aforementioned puttanesca sauce, really throw down and give the tongue something to dance over. The salt from the brine, of course, intensifies the umami of all olives, but it is the darker, more ripe varieties that have more umami overall. Though, I am not sure one should count those canned giant black California olives that are so often used as garnishes in bad Tex Mex restaurants as containing umami, since I cannot really discern much of a flavor in them at all. Spanish manzanillas or Greek kalamatas, on the other hand, are well-endowed with big, palate-pleasing flavors full of the rich meaty hallmark of umami. And now, we come to mushrooms and truffles. Both are fungi, and as we have already discussed, fungi are full to bursting with umami flavor. In general, the darker the fungus, the more umami it carries; this is true when it comes to European and American mushrooms. Porcini, particularly the dried ones, black trumpets, and portabello mushrooms all contain large amounts of naturally occurring glutamate, while white mushrooms, chanterelles and oyster mushrooms carry smaller amounts. Notice, however, that I said -smaller- amounts. Umami is still present in all mushrooms, so use what you have! And, as always, if you rehydrate dried mushrooms in water, stock or wine, be sure and use some of it in your sauce, gravy or soup. The trend of darker fungus containing more umami is reversed when it comes to truffles. With these highly prized fungi, it is the paler white truffle that outperforms the black truffle when it comes to umami. I personally, have never cooked with truffles, except in culinary school. I have eaten them a few times, and been amazed at how much flavor such a tiny bit of tissue can hold and release into a dish. To me, these little earthen gems are magical, but quite beyond my budget. However, if one wants to utilize the food-enhancing qualities of the truffle’s aroma and flavor, an affordable alternative is available in truffle oil. Made from olive oil into which truffles have been steeped, I have used it at the end of cooking to enhance scrambled eggs, omelettes, cream sauces for steak and fish, and mushroom sautes. As in rice wines, grape wine is yet another carrier of umami, though, like mushrooms, the darker the wine, the more likely there is to be a lot of potential umami taste locked within it. Gutsy aged reds and fortified wines such as sherries, ports and madeiras are more apt to have a lot of potential umami than young reds or whites.In many cases, it is often the aging that brings the umami flavor out, particularly if the wine is aged “on the lees,” meaning, with the dead yeast cell sediment. Cheeses, especially well-aged hard grating cheeses, are great sources of umami. The longer a cheese ages, the more chance bacterial enzymes have a chance to work on the curds, changing their character and developing complex flavors. Parmigiano-Reggiano is practically off the scale in ithe amount of umami it bears, but parmesan, romano and asiago are three other cheeses filled with umami, which are easier on the wallet. (Just don’t use that awful crap in the green can–you know which one I mean!) A special category of cheeses, (even if I am allergic to them and should never eat or cook with them) must be noted–the ones that have been aged with molds, such as the blue-green cheeses and the ripened, soft cheeses. These have had double enymatic action from both beneficial bacteria and molds, and so are filled with the rich complexity of umami. Gorgonzola, Roquefort, and Maytag all can give a huge amount of umami flavor with the use of a sparing amount of cheese. The best rule of thumb when it comes to assessing the umami in cheese is to remember that the older it is, the more likely it is to be umami-filled. Finally, I will briefly talk about corn. All grains carry quite a bit of potential umami, but often require significant processing to make it available for the tongue to taste. Not so corn; its potential umami is easily made available by cooking it as a vegetable, or by using it as a grain in breads, tortillas and chips. Many Native American societies were based upon the consumption of corn, and so there are many preparations that go beyond corn on the cob that are all very flavorful and very satisfying. Posole, a dried, lye treated corn, is one example of an amazingly simple, but flavorful dish that relies heavily upon corn’s native umami flavor. Usually cooked into a stew flavored with onions, chiles and tomatoes, posole is a soul-stirring meal that is very savory and soul-satisfying. Another simple dish that relies heavily upon the simple, but delectable flavor of corn are hand-made tortillas, which are in turn eaten plain, or are wrapped around any number of fillings for a seemingly endless number of dishes in Native American cuisines. And, as always, I will include a few recipes to spark imaginations. Thanks for the great posts in this series. I’m not sure, however, that I’m clear on the difference between salty and umami. Perhaps you can try and explain? I have always had a thing for Clamato juice; now I know why. I am not much of a drinker of mixed drinks, but I tried one from a newspaper article a while back, and have made it several times. It is clamato juice, dry sherry, and lemon juice. Sounds weird, but I love it. I believe it was called a “Sir Francis Drake.” I have been adding smoked spanish paprika, ever since I realized that it was fino and tapaps in one. Umami provides a meaty, savory, satisfying flavor in foods that is enhanced and made stronger by salt. Salt and umami work together complementarily. There are going to be about four more posts in this series, and then, I will go on to other topics! I always liked Bloody Marys made with equal parts Clamato and V-8 with a dash of Tabasco and Worchestershire sauce…now, I have a hint as to why. I usually grossed people out drinking them, but well, they always tasted more nutritive than alcoholic…. The brain does require amino acids to function, so maybe that was my instinctive reasoning. Reading your Umami notes led me to cook a favorite umami-rich treat this weekend — Italian sausages with Porcini mushrooms (dried, reconstituted). The recipe involves browning the sausages in a little oil, then adding red wine and reducing that to nothing, then adding the porcini mushrooms and soaking liquid and reducing that to nothing again. The sausages turn mahogany and develop an amazingly flavorful outer skin, partly salty and immensely rich with the umami flavor. Richard–that sounds fabulous! Reduction is always a good way to concentrate flavors, but I think it does a particular bit of magic on umami. this is about your ‘meat-comes-from-animals’ post. i read it only right now. i’m a vegetarian, from kerala, india. born a vegetarian, brought up a vegetarian, tried to turn a non-veg for sometime (as part of teenage rebellion), found out there are better ways to rebel other than doing something you never enjoyed and turned back vegetarian. (but,i eat eggs and love them). it was a great article. i too really believe in what you said. even here, i find similar responses. especially with regards to the meat-eating habits of people from other cultures. one day, i was having lunch in a restaurant with some staunch non-veg friends. as usual here, some started teasing me for my vegetarian habit (its quite usual and i’m also quite used to handling the comments). then, i started describing the meat-eating habits of people from some parts of india, who love dog meat. suddenly, these same friends who were teasing me for not eating something that i hated, started to protest. they couldn’t stomach the idea of eating dog meat ! my question is, if you can eat meat of one kind of animal, then what’s the problem with other people eating the meat of other animals ? and, there are a lot of staunch non-vegetarians in kerala who would nauseate when seeing a roasted chicken or turkey in the western style. well, its quite interesting ! I have no problem with people from other cultures eating dogs or cats. I am not into the practice myself, because I generally am not of the belief that carnivore meat is all that tasty. I know that when you feed swine meat scraps, it can sometimes give their meat an off flavor that is not pleasant. I really don’t care what animal people eat, so long as they treat it humanely while it lives, and kill it quickly and humanely at the end, with as little pain and fear as possible. Oh, and so long as the animal is not hunted to extinction or overfished to extinction, either. Other than that–whatever someone wants to eat is fine with me. That said–I am very fond of my cats and dogs as pets, and would probably be sad to see dead, skinned versions of cats and dogs in a market. I would be sad, but I would get over it. Now–if someone were to decide that they needed to eat -my- cats–well, now, that would be a problem! I am glad you enjoyed the essay–it still amazes me how far it has travelled!